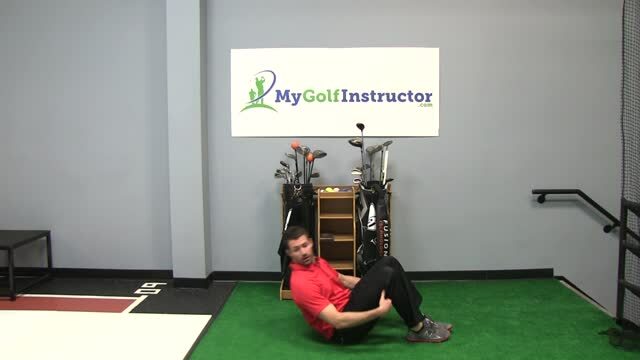 Description: The Single Leg Bridge is a very common and necessary golf strengthening exercise performed while laying on your back. It is used to target mainly your gluteus muscles and your hamstrings although it helps to strengthen the core muscles (abdominals and lower back) as well. There is hardly a golfer on the planet that would not benefit from performing the single leg bridge as a regular part of their fitness routine as glutes and hamstrings are used throughout the golf swing and are key muscles for power and stability. To start lay flat on your back and then pull your knees up so that your feet rest flat on the floor. Then pull your feet in towards you so that they are aligned directly below your knees. For this exercise you can keep your arms straight with your palms flat on the floor or as you build strength and stability you can cross your arms across your chest. Next, raise your hips up into the air so that your back is straight and your knees are in a straight line with your shoulders. You will feel your glutes, abdominals, hamstrings and lower back muscles activate. The next step is to raise one leg and point it out straight keeping your thigh level with your other thigh. Your hips should remain level and should not sag down or wobble. Count to 20 seconds and then relax putting your foot back on the ground. If this is a big struggle for you and you feel a lot of wobbling or sagging of the hips you may want to try it first with two feet on the ground. If it's not a struggle then switch legs and work up to 3 sets of 8-10 repetitions with 20 seconds on each side. Note: Start at whatever time you can even if it's only a few seconds per side and work your way up from there,but as weeks pass and you get stronger you'll be able to increase time and repetitions.